Behind every cycling win there’s a story no one’s privy to aside from the athlete. It could be a struggle with depression, the likes of which Kaitie Antonneau recently revealed. Or an athlete might need to figure out how to put out of mind an ongoing dilemma outside his control that could significantly affect his short term career. Likewise, every win—indeed, every result—delivers a lesson. 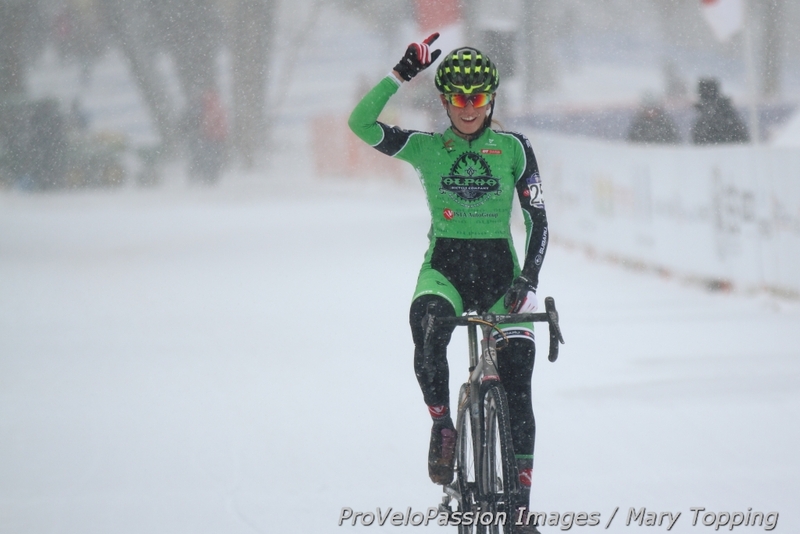 Katie Clouse’s women’s 15-16 national cyclocross championship win in freezing, snowy Hartford highlighted one that’s especially learned through cyclocross and that demonstrates why ‘cross racing builds resiliency in kids. It’s the ability to adjust to the unexpected on the fly. The unexpected occurs frequently in ‘cross due to changing weather conditions, problems with equipment or getting stuck behind lapped riders. For Clouse it came in the shape of a snowstorm that appeared after she toured the Hartford circuit that morning. 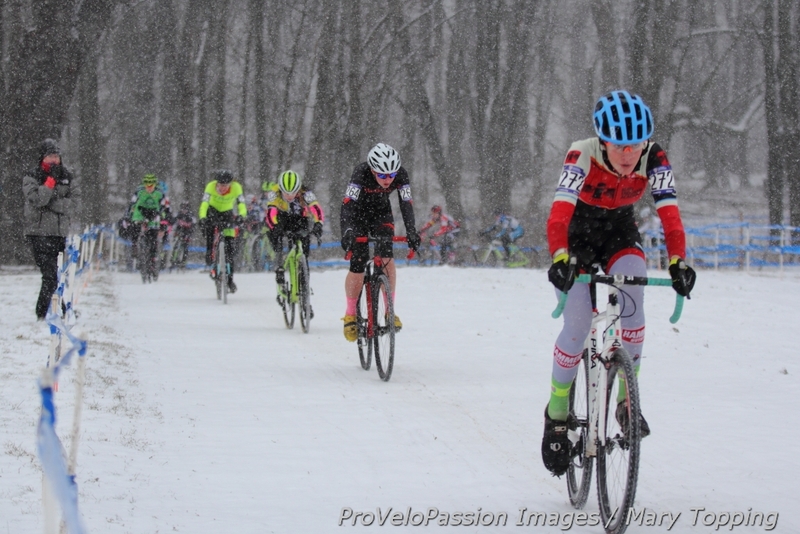 Snow quickly blanketed the course, adding a slick coating to already frozen ground that forced the Alpha Bicycle Company – Vista Subaru rider to make adjustments. “It’s so icy out there. 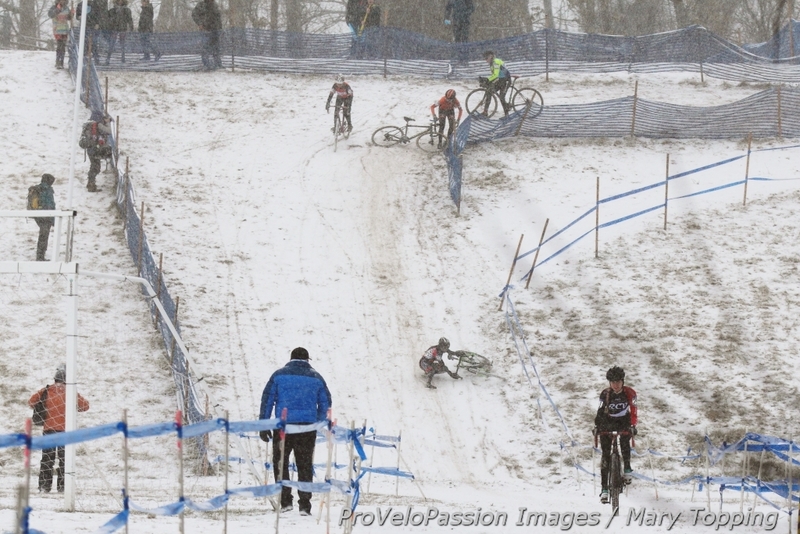 I didn’t realize how icy it was until I started falling all over the place,” she said after the race. “It was not really what I expected, because earlier when I was riding it wasn’t as slippery. Clouse adjusted in the moment to an unexpected challenge by accepting the situation, deciding how to deal with it and putting her plan into action. That’s resiliency and one reason why she’s such a successful ‘cross competitor. Women’s 15-16 field approaches Bonk Breaker Hill in lap one. Clouse slipped a pedal at the start.